One of my favorite art collectors approached me a couple of weeks ago and asked me: “Do you know that Montgomery County’s Office of Community and Economic Development has a special section for artists? He showed me on his phone and by gosh, there it was! Montgomery County, Ohio for many years has been a leader in supporting the arts, providing grants for artists in many disciplines. Due to budget issues, these grants are on hiatus, but this new app could be very helpful. Take a look: http://www.businessfirstdaytonregion.com/. Go to Tools For Your Business-top left, then select on bottom right “See more” and you will see The Business of Art. 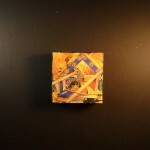 This entry was posted in Pip's BLOG and tagged advocacy, art, Art business, arts support, Dayton, Dayton Art Institute, Dayton Visual Arts Center, Economic development, Marsha Pippenger, Montgomery County, Ohio, Ohio Arts Council on April 24, 2015 by Marsha. and it was here, in Dayton, where I live: The City of Peace. This reference may or may not be familiar to readers, but Dayton really is known as the City of Peace. This is due firstly, to the Dayton Peace Accords, the agreement hammered out here to end the war in Bosnia. Since that time Dayton has become home to the International Peace Museum, the Missing Peace Art Space, the Peace Bridge, and other endeavors to promote peace in our world. Much of our city’s efforts involves the artful pursuit of peace, as I call it. That’s because many of our efforts to promote peace are visual and literary. I was thinking about this because yesterday in my church we dedicated a permanent Prayer Wall, a place for our notes to that higher power. This had meaning for me because I was asked to create the design for the Prayer Wall, which was then built in wood by a talented craftsman. My intent was to allude to the Western Wall in Jerusalem where people of all faiths come to tuck their written prayers into the cracks of the stone wall. Our wall is wood to match our sanctuary, but it evokes the Western Wall in its design. I designed it in three parts so it also alludes to medieval triptych altarpieces. I would like to see our focus on peace spread throughout the world. Let’s work for that. And artfully speaking, designing the wooden Prayer Wall inspired me to create collage on canvas reflection walls, which I will be posting here! We’ll start with one: 9″w by 12″h collage on canvas, made of handmade and machine papers, clear acrylic finish, wired and ready to hang, $165. This entry was posted in More art, Pip's BLOG and tagged art, Bosnia, canvas, city of peace, collage, Dayton, Dayton International Peace Museum, Dayton Peace Accords, handmade, Jerusalem, Marsha Pippenger, Missing Peace Art Space, mixed media, Ohio, paper, Peace Bridge, prayer, prayer wall, Wailing Wall, Western Wall on September 13, 2011 by Marsha. It’s an intangible. How can you explain to someone who has never experienced the power of an original piece of work, something that has sprung from the thought of one human being, brought into existence due to that person’s trials and errors, sweat, mental anguish, trying to get it right, to make physical that which he or she sees in the mind’s eye? Art adds life – to the walls of your home, your cubicle at work, your city parks, the very roadways you travel – breath and thought and feeling and connection, a communication offered from the artist to you. It was a difficult year, 2010. Many of us felt the negatives of an economy sliding downhill, jobs moving in not equal to the companies moving out, the broad sweep of cuts to the arts because funds are stretched to the nth degree just to cover the most basic of services. Hard decisions have had to be made. We all want to live in a community with plenty of recreational opportunities and cultural offerings. Most of us realize that in our current world we must get creative to provide those amenities when our cities are pushing to fill empty buildings, entice new enterprise, appeal to and keep our young adult residents. This is why we need the life sustaining power of art more than ever, and it is also why it is time for those of us who live and breathe and work in the arts to do more – I know, I know, we all are always being asked to do more – but small things can truly add up to big accomplishments. There is strength in numbers, and while competition is healthy, there really is great power in collaboration. Dayton, Ohio, where I live and work, is remarkable in its offerings in the arts; it has more than most cities its size (a provable statistic by the way). We have more talented professional artists than most, we have fine galleries that could use more traffic and support, and we have an art institute that rivals those of many larger metropolitan areas. Dayton has been blessed by the philanthropy of past citizens who loved this city and its people; we are still enjoying the fruits of that generosity today. Moreover, we are charged with living up to that legacy. We need to, now more than ever before. This entry was posted in Pip's BLOG, Works in Progress and tagged 2011, advocacy, art, Arts Advocacy Day, arts support, Dayton, Dayton Art Institute, Dayton Most Metro, Dayton Visual Arts Center, Downtown Dayton Partnership, Marsha Pippenger, Ohio, Ohio Arts Council, paper, Wright State University on January 8, 2011 by Marsha. 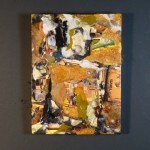 Under Construction, 5″ x 5″ collage on canvas, $25, from the Affordable Housing series. This entry was posted in More art, Pip's BLOG and tagged art, building, canvas, construction, Marsha Pippenger, miniature art, Ohio, Ohio Arts Council, painting, paper, small art, storytelling, under construction on November 15, 2010 by Marsha. I had a very exciting day last Wednesday, Arts Advocacy Day in Ohio. I traveled to Columbus with other arts supporters to lobby our legislators on behalf of the arts. Ohio is in a budget crisis and the arts have taken a huge hit as state government wrestles with budget shortfalls and how to allocate limited funds. Last year the budget of the Ohio Arts Council was cut 47%. I and a large contingent of artists, arts patrons, arts lovers, and arts professionals from Dayton, along with groups from all over Ohio urged our government leaders to do their utmost not to cut us further, and maybe even add back some of what we lost last year. Arts related businesses contribute to the economic health of the state; as well arts education is an integral component of a well-rounded student (more on this later). I want to get on to the next exciting part of the day: the Governor’s Awards! This year, two awards went to Dayton folk: Marsha Hannah and Kevin Moore, the dynamic duo behind the Human Race Theatre Company, won the Governor’s Award for Arts Administration; and Jim and Enid Goubeaux, long-time arts supporters, won the Governor’s Awards for Arts Patrons. As is usual for Dayton, it seemed half the city turned out at the luncheon to cheer them on. We have great arts and great arts supporters in Dayton and we are very proud of our artists! This entry was posted in Pip's BLOG and tagged advocacy, art, Arts Advocacy Day, arts patrons, arts support, Cultureworks, Governor's Awards, Human Race Theatre, Ohio, Ohio Arts Council on April 26, 2010 by Marsha.